Makah artist Alex McCarty is the great-grand son of Hishka, who was chief of the Waatch village, one of the five villages in Neah Bay, Washington. Alex is a carver, painter, printmaker and teacher. Alex earned his Bachelor in Visual Arts from the Evergreen State College in 2000. In 2002 he obtained his Master in Teaching degree from the Evergreen State College. Following his Masters he was the art/carving teacher at Chief Leschi Schools for several years. Alex is currently teaching woodcarving in a full year program, Studio Projects: Tradition and Innovation, at the Evergreen State College. Alex has a great respect for older carving traditions. His interest in Makah carving traditions and culture was triggered in high school, when he was asked to work on a diorama of the Ozette Village for the Makah Museum. Working on the project over a nine-month period, Alex had a chance to look deeply into the past. Part of his preparation for making the miniature model was to visit the landforms at the site, and to become familiar with the collection of artifacts housed at the museum. It was Alex's job to understand everything he could about everyday life at the village, and this helped to create his passion for history. 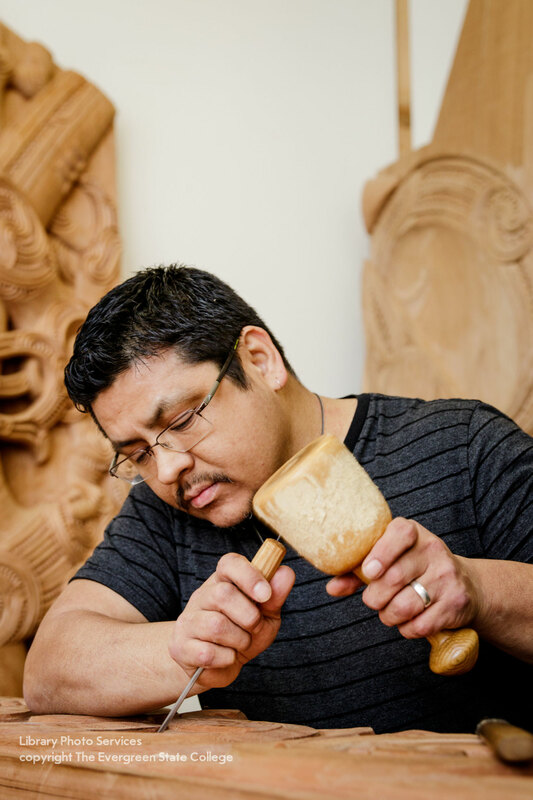 Through carving, Alex seeks to preserve cultural traditions that he can trace back through time. By observing the pieces from Ozette, as well as other classic West Coast carvings, he discerns "prevalent form-lines," which characterize the Makah tradition. He works hard at understanding the essence of his heritage, and sees his own work as a preservation and interpretation of this older style. Alex is driven to understand the past in his quest to develop his carving. He observes that "you need to 'get' something before you can preserve it." Throughout his work, Alex strives to incorporate flowing, bold-line designs that he feels are so characteristic of classic West Coast artwork. It is important to him that his work is done well, and that his designs work from different perspectives. As a teacher, he makes the analogy that we need "to see things through multiple perspectives-the way that other people see things" in order to gain a deeper understanding of the world. While Alex's work is in demand, often commissioned by galleries or individual collectors, he sees his work as providing more in his life than just income. He values teaching and learning from other artists, and advises people to seek out learning opportunities such as the one he had at Ozette, which he sees as an under-utilized resource. Perhaps his approach to his carving tradition can be summarized in this way: "learn it with care, preserve it with beauty, and pass it on." 2014 - Tacoma General Hospital, WA. 2013 - Makah Museum, Neah Bay, WA. 2012 - Legacy LTD Gallery, Seattle WA. 2011 - B2 Fine Art Gallery, Tacoma, WA.